‘always look on the bright side of life’. Since the union jack, designed in the 17th century, is red, white and blue, in what way might Damien Hirst, whose design is – er, red, white and blue – be deemed to have ‘re-designed’ it ? Surely the perplexed person from Tunbridge Wells can see from the images how the traditional flag has been reinterpreted by the artist? once again hurst shows the world Britains total lack of visual senseability . A truly useless artist stating the bl——–g obvious and making a load of cash in the process. Only Britain would hold this muppet up as a great artist whilst real talent and beauty is left on the walls of the creators unseen. Apparently the only people who clicked on this were people looking to express how visionary they are by being contrarists and dismissing an incredibly popular artist. As for the ‘real talent,’ it doesnt seem reasonable to have some heroin addict soho artist putting exhibitions on in his mates basement to be the countries representative artist to the rest of the world. From the picture, looks like a good show. Here’s an up-close lok at Damien Hirst’s spin flag formally titled ‘Beautiful Union Jack Celebratory Patriotic Olympic Explosion in an Electric Storm Painting’ (2012) for your readers. most of the artists on stage ,pink floyd ,the beatles ,the who ,david bowie …… at some point where heroin addicted artists . And if we may pop over the big pond to USA the greatest song writer of all time, bob dylan was a heroin addict. Lewis Carroll ,…………… the list goes on. i,d rather be represented artistically by all of the above heroin adddicts than some talentless baboon who knows nothing of the creative process. oh i nearly forgot picasso smoked opium whist living in a basement during his rose period putting shows on for his mates! It never takes long for an internet debate to be reduced to nonsense . Herion neither does nor does not make a good artist. The reality is Hirsts process has been available as a toy by crayola for decades (Crayola Colour Twister Spin Art Set) the toy may have been inspired by hirst but this is irrelevent – pretending this is strong art is nonsense . This doesn’t make it unsuitable for its location but good art it definitely isn’t. so heroin aside… art or not? if we are going to define painterly technique as art (ie. crayola versus oils) then I feel some of us may be missing the point…. 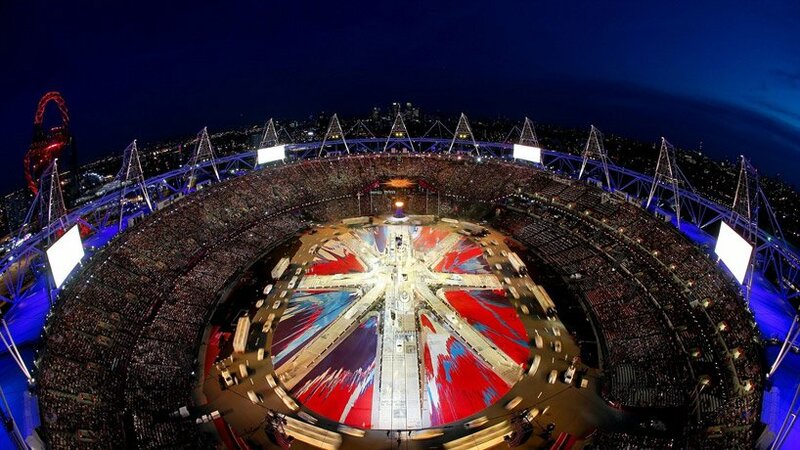 this is not design this is a ground instlation using the form of the \”union jack\” to make a musical performance. beside that it was a nice show, but not awsome! This is fabulous ! This means how humanity can make beautiful things and touch the hearts. This is what these photos do – they touch my heart. Not art, as much of Hirst’s work isn’t, which is not to say it isn’t visually arresting. Hirst is an illustrator, a provocateur, a showman. Mainly, he’s an enormously successful businessman. His business? Entertainment. As such, he was an excellent choice for this assignment, and by the pictures he pulled it off. But let’s agree that it is not art. David, if you’re going to attempt an opinion, at least spell his name right. Otherwise it makes you look a little….ignorant. Just saying’ ! This is design, it\’s not art work!